Resources for making games are plentiful and there are many treasure troves of links to those resources scattered about the internet. Especially for gamejams. The aim of this specific post gives you a treasure map of links which will help you on your initial journey to track down that tutorial you need or discover something fun and new to consider adding to your game or gamedev toolkit. 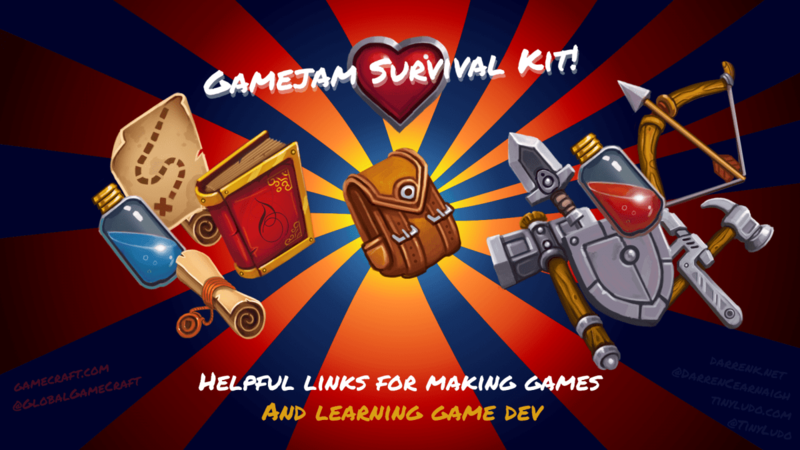 Currently, I am linking to curated resource lists as well as direct links to the most prominent resources in order to help you prepare for participating in gamejams as well as get you up and running as quickly as possible. 2. Free, with free trials, or at least a minimal financial cost. Initially, this is the top 5 most useful ones from my bookmarks. I want to grow this page over time, aiming to become a nice little place to get started with a focus on small games. Please comment any good links and I will add them in a future edit (I’ll check them first!). The featured image in this post was made using assets from Ravenmore’s Fantasy Icon Pack 2 which is shared under the Creative Commons 3.0 License. You can find more info on Ravenmore’s portfolio site http://dycha.net, and consider using opengameart.org to source art and audio assets for your gamejam prototypes!